Russia is pushing for the lifting of North Korea sanctions following Foreign Minister Sergey Lavrov's visit to Pyongyang on Thursday, where he met with his North Korean counterpart Ri Yong Ho and leader Kim Jong Un. Lavrov, who spoke exclusively to Russian state-owned or government-controlled news agencies, including Sputnik and Tass, said denuclearization would not be fully realized unless sanctions are lifted. The comments from Lavrov run counter to U.S. efforts to place "maximum pressure" or sanctions on the Kim regime until North Korea confirms a commitment to CVID: complete, verifiable, irreversible dismantlement or denuclearization. 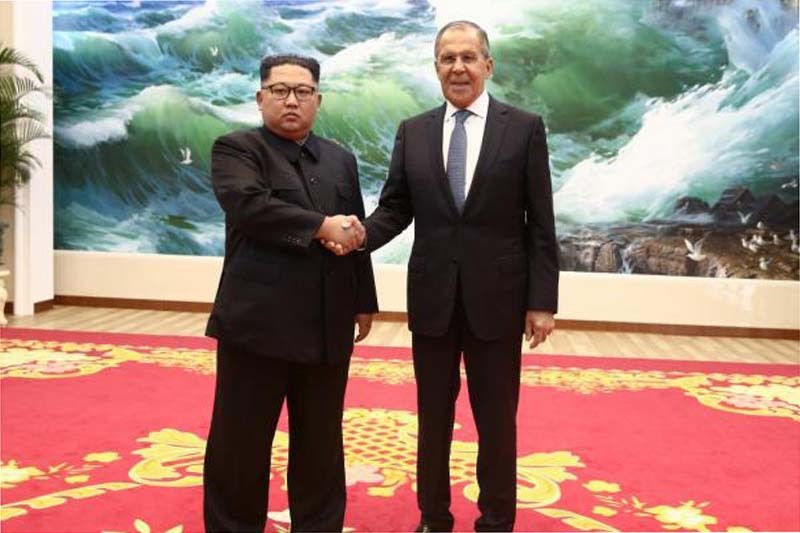 "As we start discussions on how to resolve the nuclear problem on the Korean Peninsula, it is understood that the solution cannot be comprehensive without the lifting of sanctions," Lavrov said. Tass reported the top diplomat added what's left are "technical issues" to be resolved by negotiators, a reference to U.S.-North Korea talks that are ongoing in Singapore and New York. The Russian foreign minister also said he supports inter-Korea dialogue. South Korea's pro-engagement policy in the past has led to economic cooperation among the two Koreas and Russia, including a project that involved the transport of Russian coal to South Korea through the Rajin-Hasan Railway that runs through North Korea. That project was suspended in 2017. Lavrov also said engagement should be approached in a careful manner and no party should engage in drastic actions, according to Tass. The Russian diplomat also invited Kim to Moscow and laid a floral tribute to statues of past leaders.